Yesha leader: I thought Kerry was just ignorant and deluded, now I see he’s bought into anti-Semitism. A leader of the Israeli communities in Judea and Samaria (Shomron) has harshly criticized United States Secretary of State John Kerry for his declaration that Israel could face international boycotts if it does not succeed in making peace with the Palestinian Authority (PA). 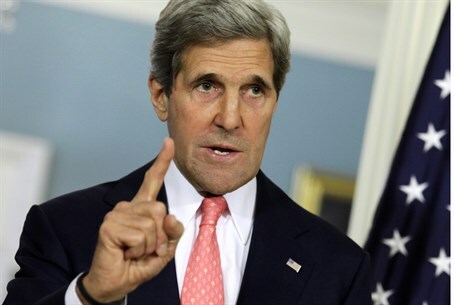 Kerry’s boycott threat shows that he has bought into anti-Semitic thinking regarding Jews and Jewish motives, said Yesha Council official Adi Mintz. “Until now, I thought that Kerry just didn’t understand the Middle East, that he was deluded, obsessive and messianic,” Mintz began, referencing comments by Israeli Defense Minister Moshe Ya'alon, in a post to his Facebook page. “I thought that was why he is concerned solely with the Israeli-Arab conflict and not the violent conflicts of the world, such as the ongoing genocide in Syria,” he continued. However, he said, “Tonight I realized that he is motivated by anti-Semitism, too. ‘Hit the Jew in his pocket’ – that has always been an anti-Semitic slogan. “Anti-Semites think that Jews are motivated by just one thing: money. And if you want to hurt them, hit them in the pocket,” he explained. “The problem is that Israeli left-wingers, particularly the tycoons among them, are doing everything they can to prove him right,” Mintz added, referring to the group of Israeli business leaders who recently urged further Israeli concessions in order to avoid economic sanctions. Kerry is attempting to pressure Israeli leaders into accepting a plan for an Israel-PA agreement that would see Israeli concede most of Judea and Samaria, and split Jerusalem, putting much of the city in PA hands. According to a recent report, Kerry has had a hand in manipulating the European boycotts that he has warned Israelis of.